Afterwords consists of footnotes, references and outtakes from my column contributions published in Metro News Vancouver. Read my February 17, 2015 column How the free crossing at Port Mann Bridge is costing all of us over at Metro News Vancouver. First things first — I’m not sure what’s going on with that headline. Update: It took me a very, very long moment but it makes sense to me now and I’m laughing a little at how my 6am brain flipped out. Well played, Metro editors. Well played. I’m sad to say I didn’t have the energy to be more than mildly outraged when I read about the $90 million shortfall from the Port Mann over the next 3 years at this CBC article from last week. We’re getting a plebiscite on the $7.5 billion for spending on this package from our Mayor’s Council of 22 regional mayors. However, there was almost nothing for the $3.3 billion spent on the Port Mann bridge, which is revealing itself to be significantly overbuilt and which tossed a number of wrenches in our long-term regional transportation plan. Meanwhile, as others have pointed out, there were more people consulted for the $6 million stretch of Point Grey Road supporting safe cycling and walking, than there were for the Massey Tunnel bridge replacement, which also happens to be included in the Congestion Improvement sales tax package. Eye for an eye, and the whole region’s stuck in traffic (or in my case, shortcutting too fast through my neighbourhood and making my bike ride unsafe). As I’ve said on Twitter — TransLink can’t feel pain or be punished. We can lobby and work to make them change what they do that we don’t like, like executive compensation, and there are decent arguments to be made about that. But we cannot afford the time spent on making the stars align again. This is where the fact of the sheer complexity of the governance for transit really poses a challenge. 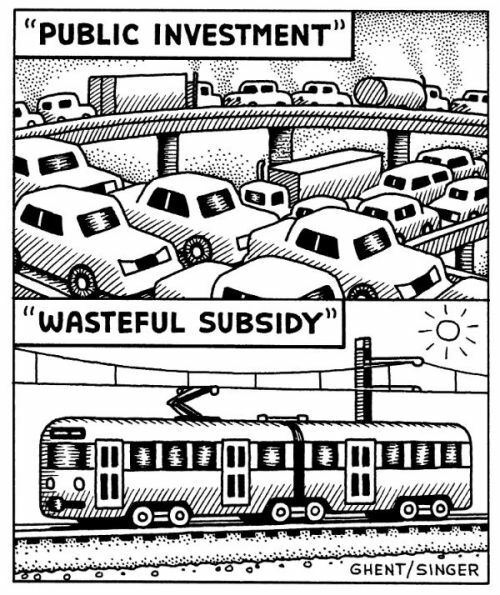 I think a lot of people cynically saying, “Oh, they’ll find a way to make those transit projects go forward, my vote doesn’t really matter because they’ll just take it out of property tax,” look at how road projects happen and think they will be equally as easy to get agreement on — when the reality is the complete opposite. Furthermore, for all the bitterness about the regressiveness of the sale tax, I think there’s a fair case to be made that property tax is even more so. After all, as this article from October 2014 touches on, people in places like Vancouver have the burden of service delivery spread over a larger population and also has a larger base of inherited assets, so some cities get more service bang for their buck. The opposite is true in Surrey, where a lot of the basics are still being built out. The varying implications of this on transit spending are yet unexplored. Yes, I skipped over Afterwords #5. I have things to say about transit police and safety as well, I promise. This entry was written by Karen Quinn Fung, posted on February 17, 2015 at 7:03 am, filed under Your Ride Vancouver. Bookmark the permalink. Follow any comments here with the RSS feed for this post. Post a comment or leave a trackback: Trackback URL.